I don't even know how to begin this...our wedding was truly the most incredible day of both our lives. We didn't set out to create something over the top, or spectacular, we didn't even set out to make it the best day ever - it just was (to us). 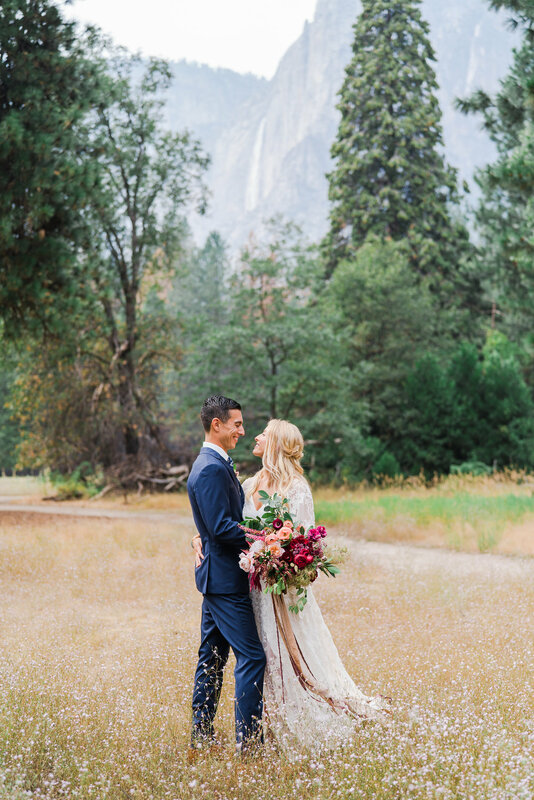 We set out to make this day feel "us" in every way we could - we picked three words to help guide us throughout our planning - emotional, adventurous and unique, which are words we came up with that describe our relationship, and in turn, what we wanted our wedding to be. After being a part of and witnessing many weddings, the main takeaway I always heard and experienced myself, is how quickly the day goes by. As soon as we got engaged, we both easily agreed we wanted to create a weekend full of activities we could engage in with all of our guests. Yosemite was the perfect location to get our loved ones away from their day to day, and escape to somewhere Dave and I always seem to connect the most - the great outdoors. 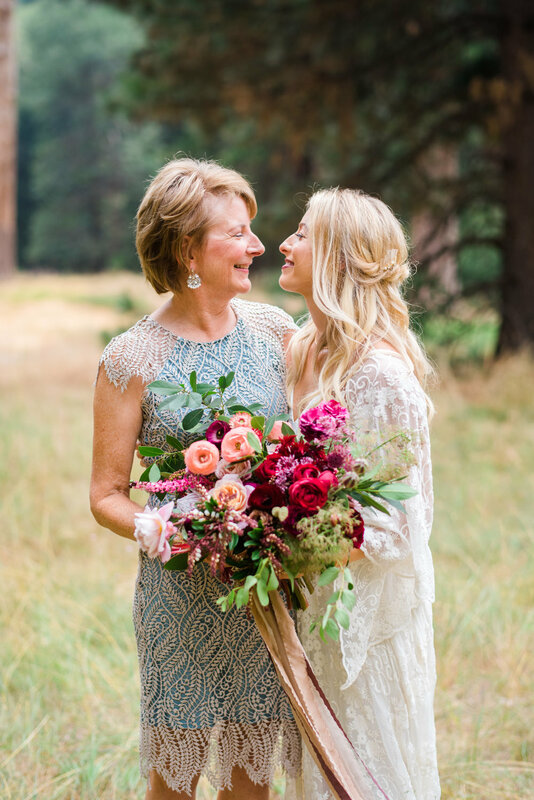 We were so excited to have adventures with guests leading up to the wedding weekend, it truly helped us get in the right mindset and embrace the sweet days leading up with hikes, cold beers, big family breakfasts, star gazing, and so, so many hugs with our 101 guests who traveled near and far to be with us as we began our new journey together. 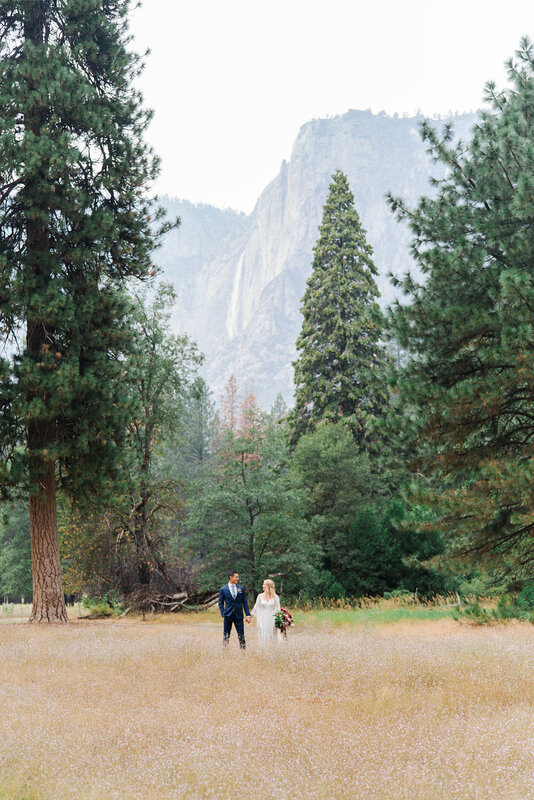 With Yosemite as our backdrop, we wanted to create a design that felt fitting of Yosemite's natural beauty, but accented with elements and colors that felt like a reflection of our personalities. In some ways, Dave and I can both be intense people, but in different ways. As Dave was a special operations Army Ranger for 4 years, he brings an intensity to everything he does with such purpose and drive, and I bring an intense sensitivity and connectedness to everything I do -- so it only made sense that we wanted even the little pieces of the day to have meaning and purpose to us. 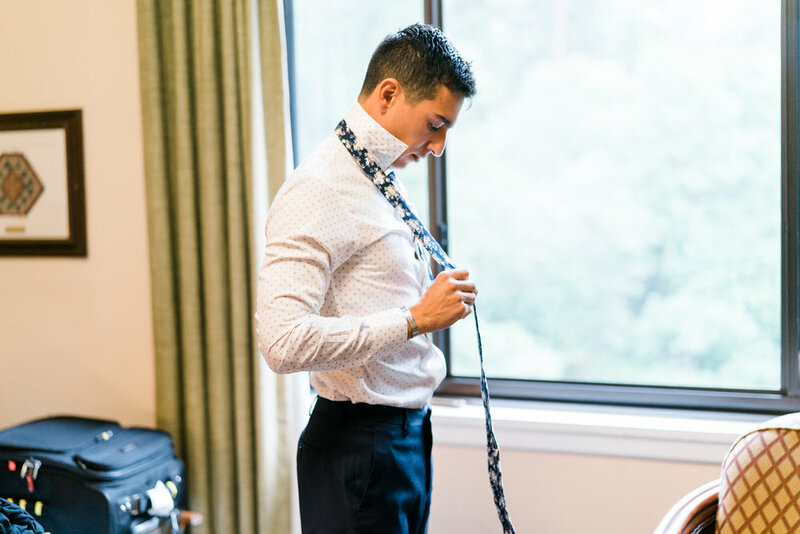 We focused a lot of time on customizing our ceremony using an initial template we purchased from Vow Muse (an awesome starting point to get a direction and foundation!) 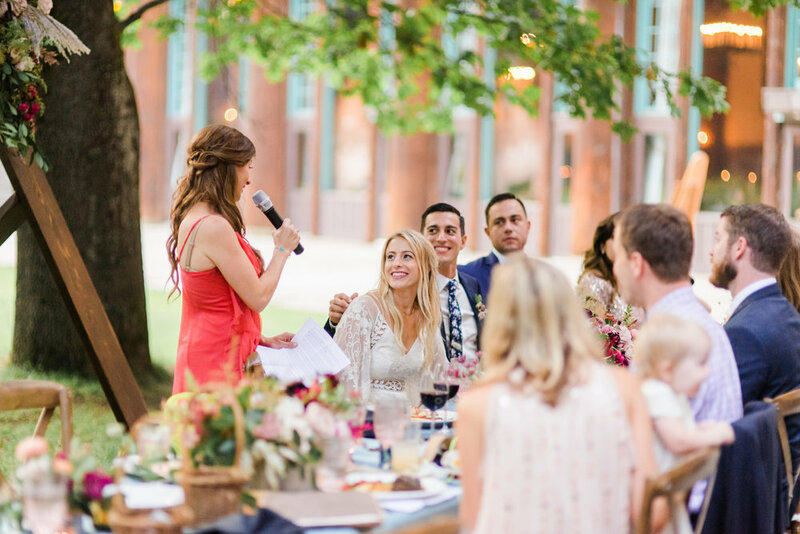 We added in a customized reading that all of our siblings and their spouses could participate in, which was so special to us, as we are the last of our siblings to get married and admire the example they have set for us with their marriages. 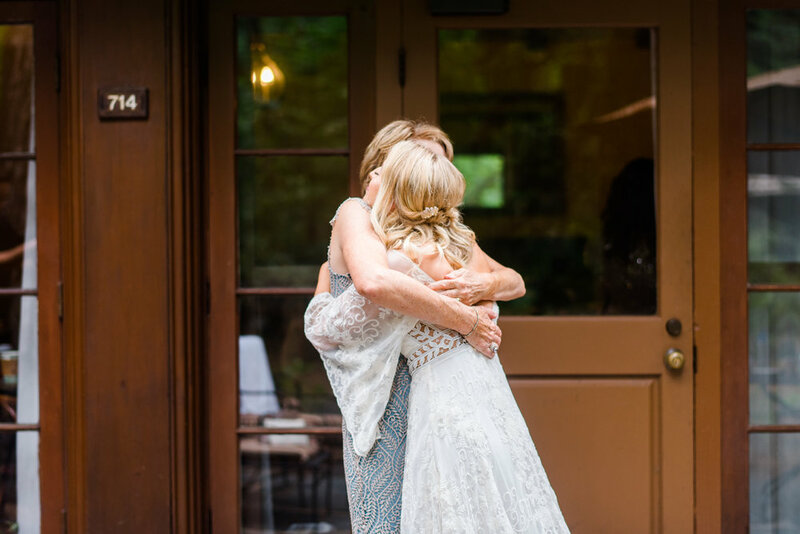 We had a reading by a close friend leading us into our vows, and we thoughtfully crafted and created each of our vows to the other, which brought us both (and everyone else) to tears. We added in a special gift exchange toward the end of the ceremony where we each gave the other a flower, which serves as a reminder of our love to each other - and with a vase kept in our home (it's a little bud vase connected to the wall!) one of us will place a flower into the vase when times get tough and remind the other of our love for one another. It became one of my favorite little pieces we added in. Our officiant was Dave's best friend in Ranger Battalion, someone who was there since the beginning of our relationship and the clear choice to marry us. 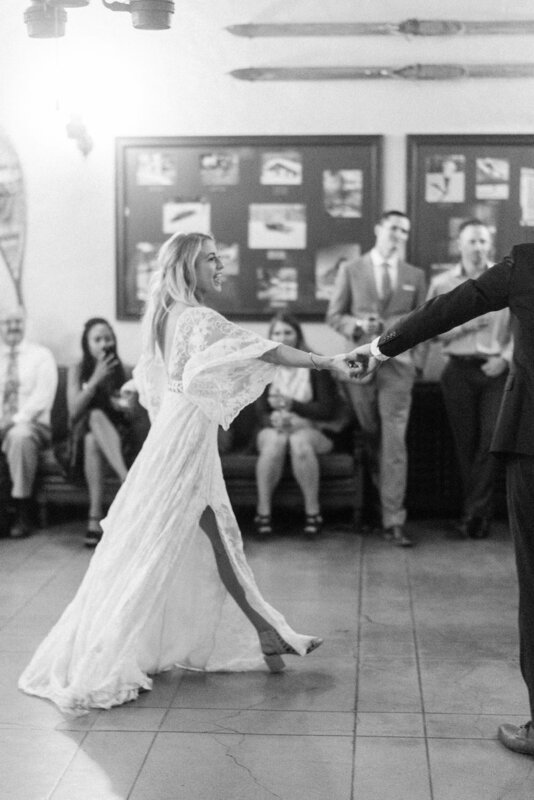 We knew our ceremony would set the tone for the rest of the evening, so wanted to be very intentional about creating something that felt emotional and brought all our guests into our relationship and the roll they also play in our lives. To top it off, Dave's best friend and groomsman built the structure we were married under. To bring purpose and meaning even into little moments of the day -- we had both of our brothers serve as our witnesses on our marriage license; I pinned Dave's boutonniere on him - reminiscent of me pinning Dave's Ranger Tab on him when he was in the Army; we each purchased a new fragrance that we used throughout the weekend and on the wedding day, and now at home every time we use them it instantly transports us back to our wedding. 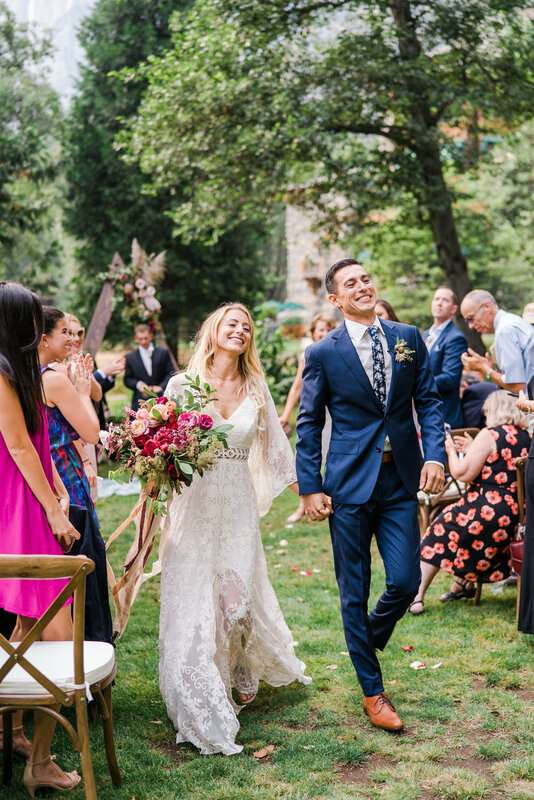 We selected my processional song together (m83- Wait), that resonated meaning to both of us and a super fun recessional song (sigala - sweet lovin). 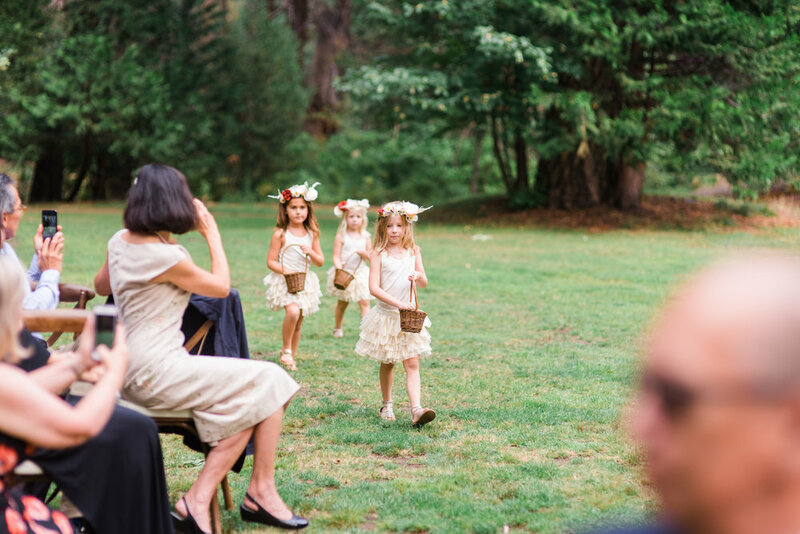 We walked down the aisle with our parents, and I opted to include only my sister and sister-in-laws as my bridal party, with all of our nieces and nephews as flower girls and ring bearers - I had so much fun crafting all of the little girls' flower crowns for them to wear; We have repurposed the rug we got married on as our living room rug; Our cake topper was two cats that were painted based off of pictures of our two kitties at home! It was also important to us to create a day that was kid friendly for all of our nieces and nephews, and littles that would be attending our wedding - so we made a kid hangout spot with a tipi filled with pillows, coloring books and masks. Because I had only siblings/sibling in laws in my bridal party, I had a group of friends come visit me before I started hair and makeup and we went on a quiet walk where I could get out all of the emotions I was feeling. 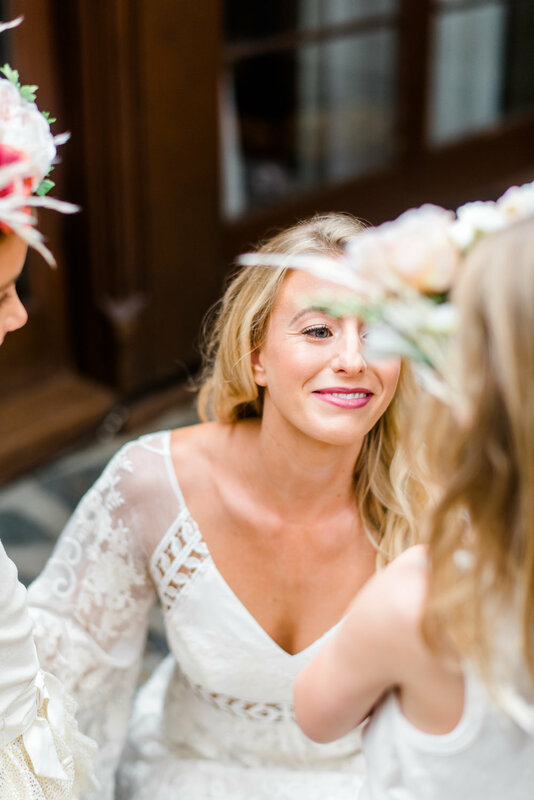 It was so wonderful to have so many people surrounding me that I loved so deeply and was able to cry to, for literally no other reason than just feeling overwhelmed by all the happy and nerve-racking emotions that I experienced on our wedding day. 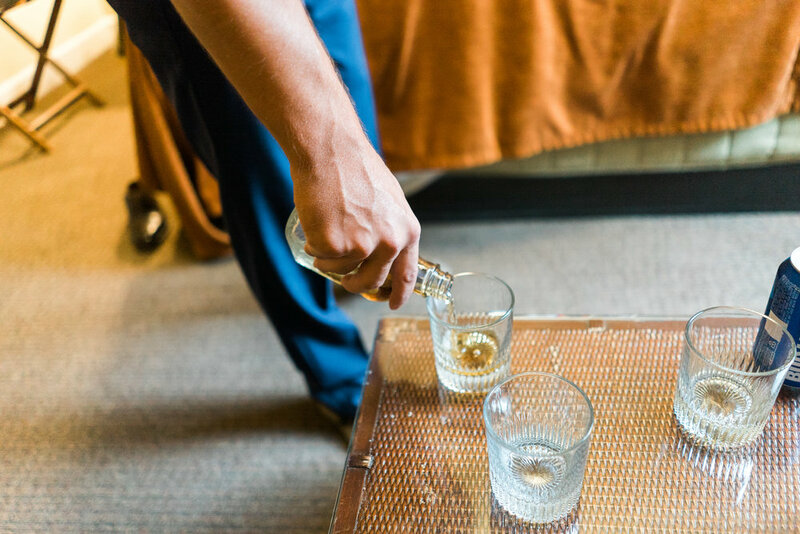 Dave and I wanted to spend as much time together as possible on our wedding day, and so did not opt for the traditional option of sleeping apart and only seeing each other for the first time at the first look. 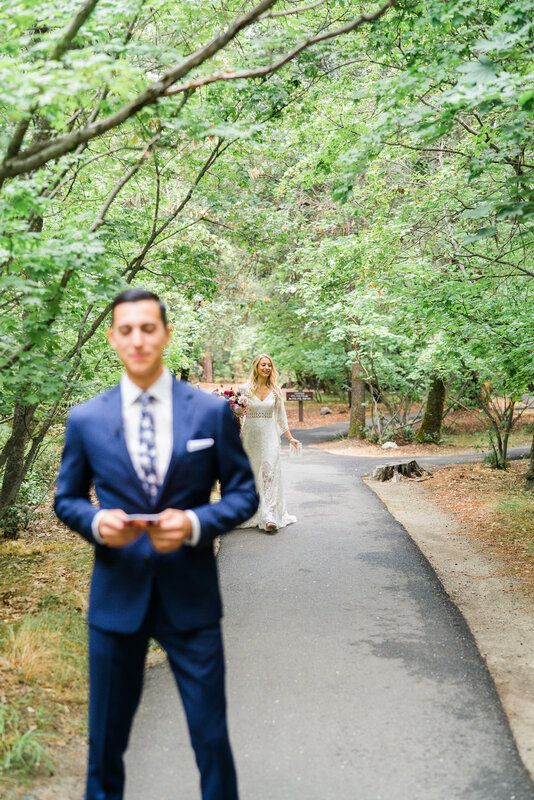 We loved waking up together on the morning of our wedding day, and saw each other throughout the early afternoon when Dave returned from a hike with friends, which helped both of us to feel more calm to be able to talk to each other and see each other throughout the day. For us, it didn't take away any meaningfulness from our first look or the walk down the aisle, and I'm so glad we did what felt right to us. 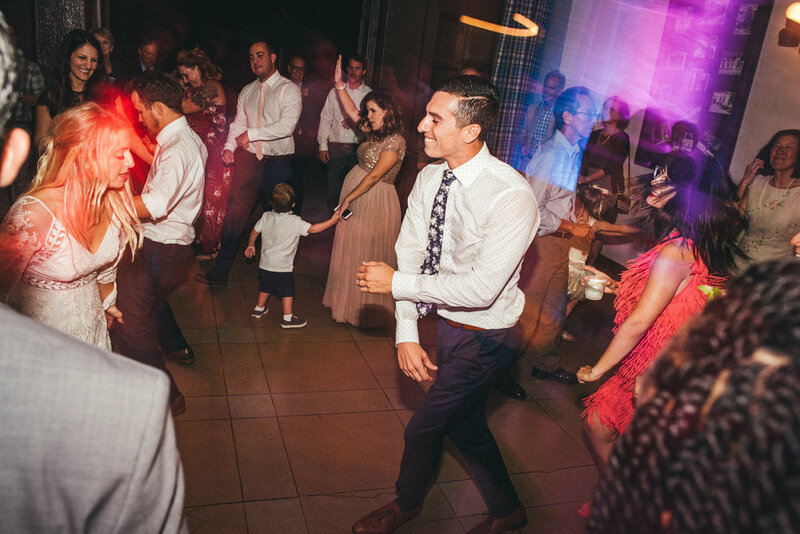 We worked with our DJ to determine the tone we wanted to set during cocktail hour, dinner and dancing. We truly felt like working on all of these pieces played such a big role in keeping our guests upbeat and feeling like the day reflected us and all of our tastes and preferences. 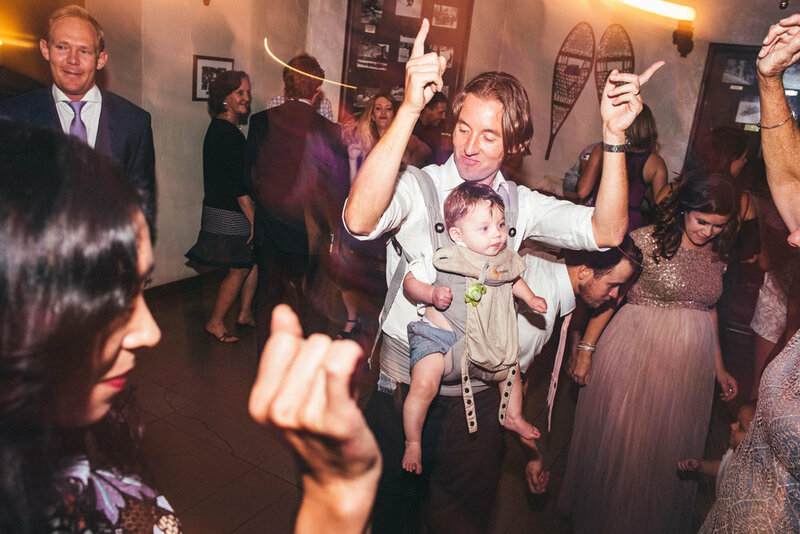 It's so much fun to listen back on music and remember it being played during our wedding and the moments we enjoyed our favorite songs together. I am a huge advocate of custom paper goods, and splurged on this aspect to help tie everything together. I loved collaborating with Cassie of Peanut Press for our detailed elements. She took my inspiration and totally nailed my vision. 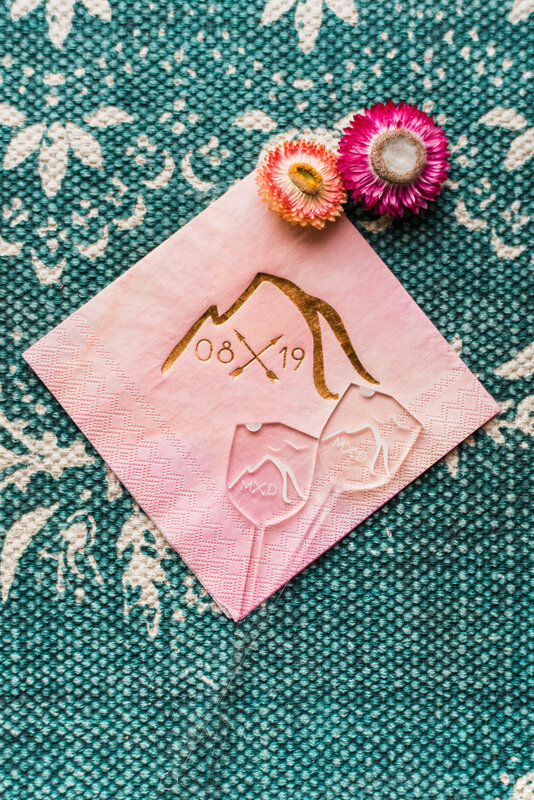 She created a beautiful custom Half Dome logo for us that we used throughout on our save the dates, as the laser cut table names on the seating chart, custom foiled napkins, our return address, and on our custom drink stirrers at the bar. 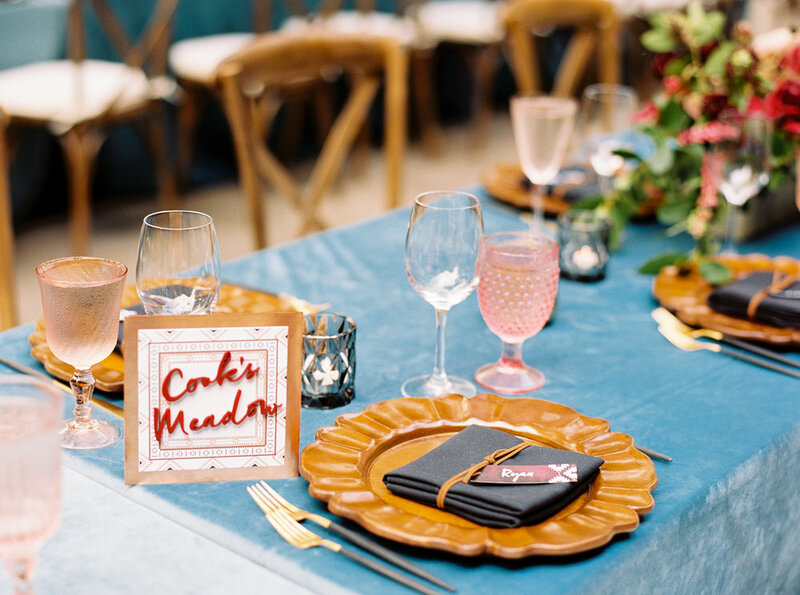 She took my inspiration of layered patterns found around our venue and created a border on our invitations and carried it over to our table numbers and utilized smaller versions of the patterns seen throughout for our placecards and dessert and guestbook signage. We opted for an etched slate bar menu to play off of the stone of our venue and the massive granite walls surrounding us. Dave and I knotted faux-suede chording around our invitation suites to hold them together, and repeated the chording by tying it around all of our guests napkins with their placecard. I attempted to do some brush lettering style on all of our invitation addressing, and we purchased special stamps that fit our organic pattern aesthetic of the invitations. We loved our tabletop design -- it felt fun, appropriate, and totally us. The teal velvet linens mirrored the teal awnings of the venue (not to mention are my favorite color) and added a beautiful brightness and life to our massive outdoor patio space. We opted for wood elements like the chargers and our chairs to keep it feeling natural, along with organic feeling ceramic and marbled floral vases. We added a hint of modern with our two toned black and gold flatware, and used black in our napkins and smoky gray votives. We had a hint of copper around our table numbers and mixed metals with our gold topped flatware and gold votives. 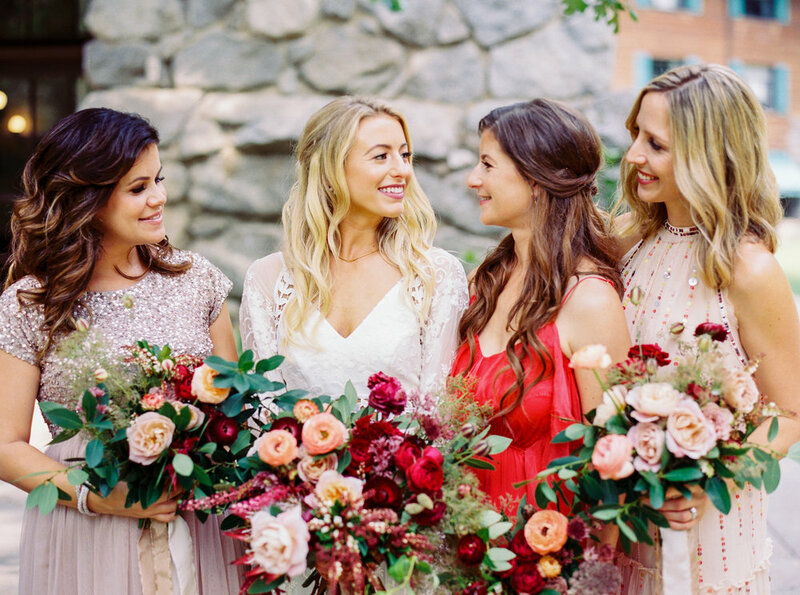 We completed the look with peachy pink goblets to tie in with the florals. 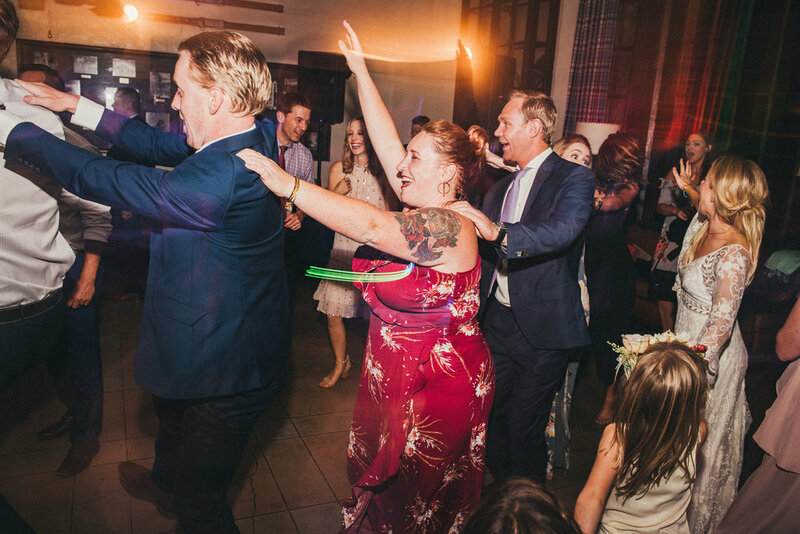 Dave and I actually took dance lessons leading up to the wedding, and it ended up being one of the most fun activities we've done together. We loved connecting in a new way, which made us so comfortable and excited for our first dance! 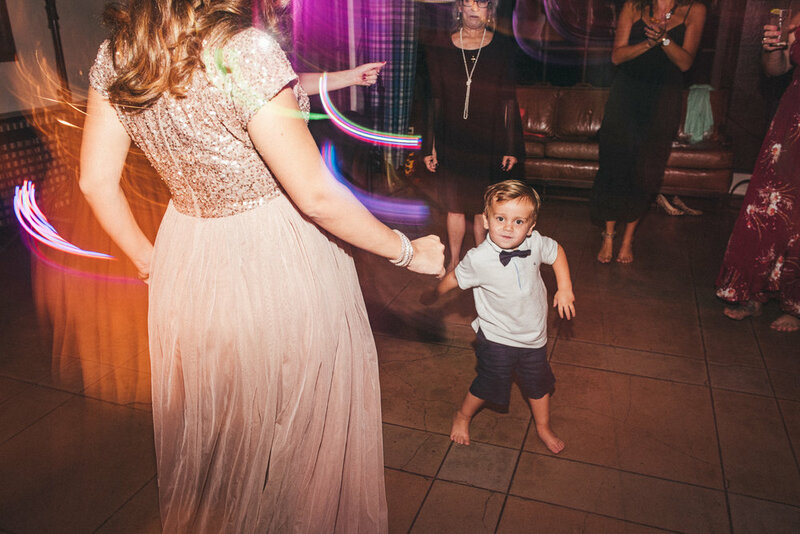 It wasn't choreographed at all, we just had the moves to make us feel confident, and a few of those pictures have become some of our favorites! We ended up singing the song (Beyonce - Halo) to each other throughout our dance and just had so much fun enjoying dancing with each other. Last but certainly not least - dessert! Dessert is something I couldn't live without, but Dave can be really picky about the sweets he likes, but cheesecake is something we both can agree on, so we opted to do a cake cutting with a cheesecake and had our two cats figurines as the topper. 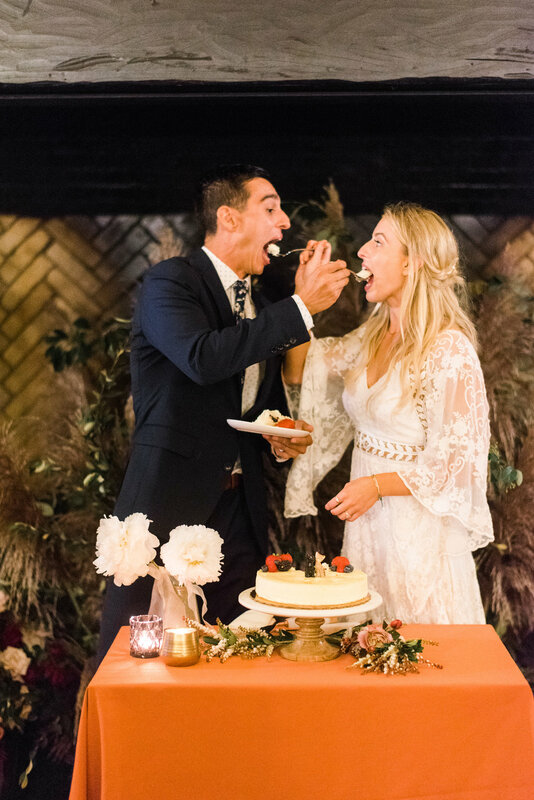 The cake cutting isn't something particularly meaningful to us, but I love the pictures that come out of it and I'm so glad we did! We didn't want to have a dessert bar, and instead treated our guests to an on the spot making of bananas foster, and trays of bread pudding. One of the hardest aspects was all the little accessories and outfits -- little things like finding a clutch that seemed just right (that I never even used! ), finding the perfect jewelry for my dress, and all the outfits and shoes for the rehearsal dinner and bridal shower was so time consuming! 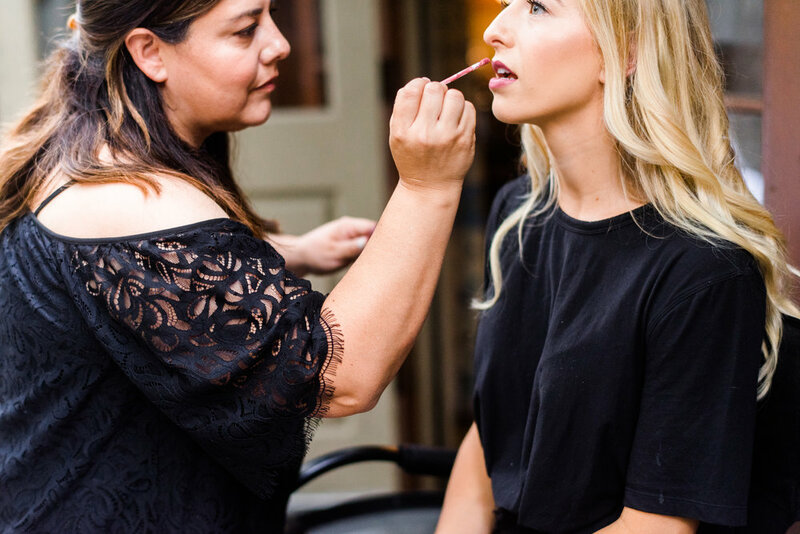 I could go on forever talking about our wedding day and all the things I learned, but my biggest advice after seeing it from the other side is stick with your gut! You know what you like, so be decisive about it and don't second guess yourself once a decision is made! 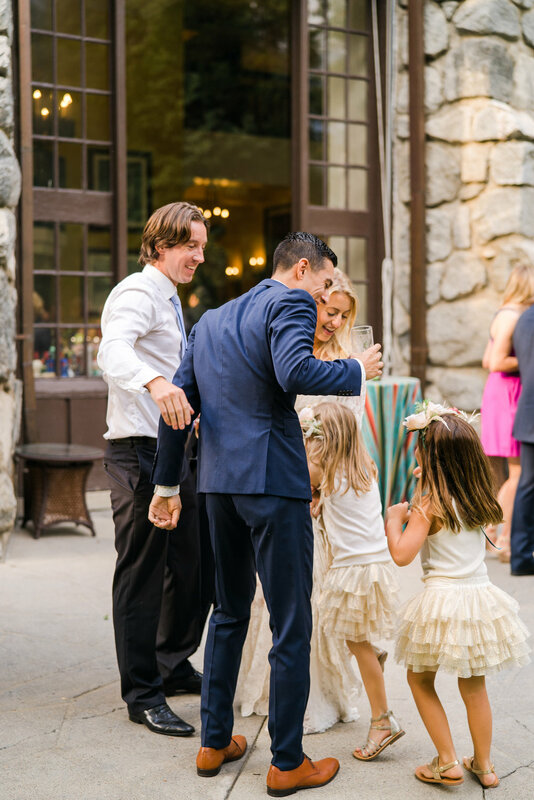 Trust your vendors, it will truly make you present in the moment to let go of thinking about any sort of scheduling or if decor is set up properly - just embrace the day! Because I had so much trust in my team, I feel like I can actually remember so much of the day because I was 100% in each and every moment, just how it should be! I hope you enjoy our photos + video below almost as much as we do! Leave a comment at the bottom if there are any other aspects you'd like me to dive deeper into about our wedding or specific questions on how to make decisions for your own wedding!! 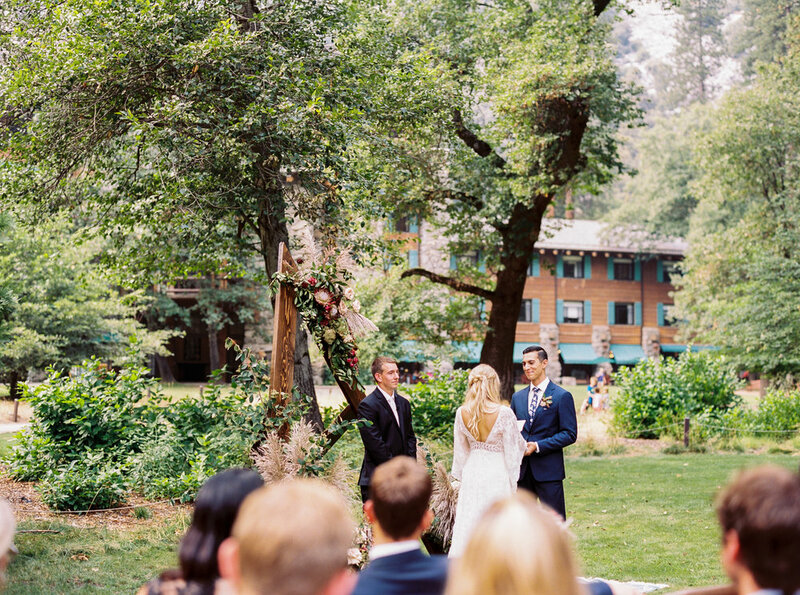 David & Morgan - Yosemite National Park Wedding Film from The Arroyos on Vimeo.